Journalists are even more prescriptive than football supporters. Barely half an hour goes by without a comment piece being published using the word 'must' in the header because of the common fallacy that it implies authority. Analysis cannot be simply analysis, opinion cannot be opinion. It has to be a commandment. Nuance is the enemy. Certainty is what counts and so the hectoring inclination flourishes. Who needs qualification when "it stands to reason, pal"? In the case of Leeds United over the next few weeks, the subject of the headlines carrying many of these edicts will be the January transfer window and the club’s obligation to invest if they are serious about sustaining a promotion campaign. It is understandable - after all, most fans indulge in this. Should' usually trumps 'could' and 'would' among the five-pint post-match pundits when we dissect the match and preach glib answers for manifest failings. And they are united in believing that strengthening the squad, adding quality and depth, can only benefit the club’s chances of capping their Premier League exile at 15 seasons. "It’s a no-brainer." The problem is Marcelo Bielsa does not agree with that reasoning. Thanks to the work of The Square Ball’s superb Daniel Chapman, some Leeds fans will be aware of the story of Bielsa at Newell’s Old Boys in 1992 making one transfer request to his board after winning the Apertura the year before. He wanted Nestor Sensini, the bright, elegant, remorseless defender back from Udinese but when the Serie A club refused to sell, Bielsa ruled out all alternatives, told his thin squad he trusted them and they went on to finish runners-up in the Copa Libertadores and won the Clausura. Quick fixes are anathema to him. At Leeds he evaluated his squad during pre-season, addressed the weaknesses, stressed his preference for one alternative for each position and professed himself happy both with the recruitment and disposals. Bielsa believes that the Under-23 squad rather than the chequebook is the safety net, knowing both that irregulars fight harder for their spoils and that novices who understand his structure and principles have an advantage over anyone who doesn’t. Yet during last weekend’s victory over Sheffield United - a third successive win and clean sheet following the gubbing by West Brom - Bielsa lost the third member of the defence that had started Leeds’ first six Championship matches to long-term injury when the captain, Liam Cooper, twisted his knee and joined Gaetano Berardi and Luke Ayling in the Thorp Arch hurt locker. 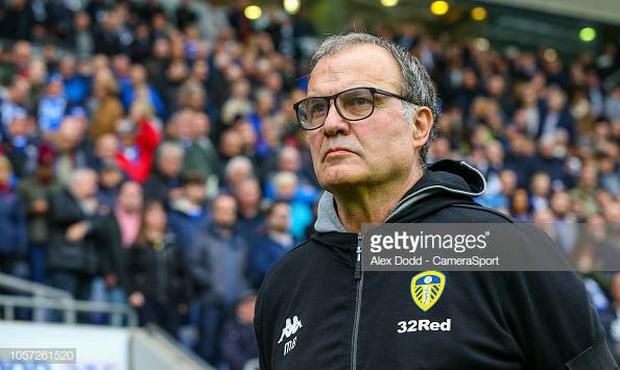 There’s a grace and maturity to Bielsa in public, not solely in his resistance to requests to chastise referees – for which he had fair grounds on Saturday – but also in his rejection of invitations to curse his luck over injuries. When centre-forward Kemar Roofe was forced out for six games in September at precisely the same time as the other experienced striker, Patrick Bamford, damaged his cruciate ligament, Bielsa was sanguine. "We have other solutions," he said and elevated the 19-year-old Tyler Roberts to lead the line. In the past he has forsworn pre- and post-match comment and swerved press conferences but has conformed to the English game’s conventions in his six months in Yorkshire. He treats every question on merit and tries to do it justice. Some of his sentences are longer than Judge Jeffries', as Jim Hacker would say, but there is logic, honesty and a refreshing appetite if not to persuade then to explain his methods and ideas. Even though he talks to us through the prophylactic of an interpreter, it is plain from his manner and words that he feels a sense of responsibility to his club, his players and, above all, to his values and the game itself. He exerts a moral influence with his bearing and patience. In the winter window, adding can mean subtraction if it dissolves the common understanding and he made no January signings at all in two years at Athletic Bilbao and his full season at Marseille. Why emasculate the players already at the club with a show of distrust? It has often proved the cruellest month for Leeds – they lost Jonathan Woodgate and Robbie Fowler in 2003, Matt Kilgallon in 2007, Jonny Howson in 2012 and Sam Byram in 2015. Most excruciating of all was Neil Warnock's heinous swap deal that sent Luciano Becchio to Norwich City in exchange for Steve Morison, a striker who averaged 15 goals a season for one who managed five in two years at Elland Road. Players who have gone on to have successful careers were brought in on loan to help camouflage the lack of longer-term purchases. Fabian Delph popped home from Aston Villa for a month to help his rehab, Jake Livermore played five games in 2011, Andros Townsend and Adam Smith legged it before their deals were up and Ross Barkley could not displace the 36-year-old Michael Brown from Warnock’s preferred XI. The club, living a hand-to-mouth existence, became hooked on short-term deals, chasing that quick fix and ignoring systematic weaknesses. That those days are gone for now will make January a calmer month and, unlike the past, if Bielsa maintains that the eventual return of those three defenders plus Bamford and Izzy Brown will be better than new signings, we can count on his sincerity. It is rare that a manager’s wishes coincide with the club’s over midseason signings, a period when the season ticket, player sales and television revenues have already been allocated. There ought to be a provision for an emergency – such as the requirement for a goalkeeper following Jamal Blackman’s season-ending tibia fracture – but Bielsa is likely to stick with what he has despite the clamour for a couple of major signings to prove the club’s intent. In February 1964 Don Revie bought the former England centre-forward Alan Peacock and in January 1990 Howard Wilkinson brought in Lee Chapman. Peacock scored eight times and Chapman 12 as Leeds pushed on both times to win Division Two. We may bemoan Bielsa for not politicking for a player of similar calibre to catalyse the promotion charge but it is not his way and no outside encouragement will sway him.